To all SuperMoms on Sunday morning. Sunday mornings are rough. If you are a mom on Sunday morning, you have a LOT to do. I, for one, have to feed the kids, dress the kids, and then, if there’s time, feed and dress myself. Of course, there usually isn’t time for me since getting the kids ready has to happen. I end up eating a cereal bar in the car looking like I woke up five minutes ago. This morning I decided to write about it while it was on my mind. I say some things that are not very nice to Ian during the drive to church. “Its not fair,” I say. “Why do you get to take your time to get ready?” I say. “I look like I woke up 5 minutes ago.” Ian says nothing. It makes me upset that he doesn’t say anything. I want him to say he’s sorry. But, what should he be sorry for? We get to church, take the kids to their classes, and spend the morning not talking to each other. During the last 15-20 minutes of the lesson I am convicted and my heart softens. I realize that we are in church and shouldn’t be upset at one another. (The only one upset is me, by the way.) I say that I’m sorry for being so mean to him in the car. We decide that we will make a plan together so that this doesn’t happen again next Sunday. We need to start getting ready earlier, we say. We can make a plan on Saturday night, we say. To our surprise, our Sunday ordeal happens again. And again. And again. Surprisingly, when I talk to my girlfriends about this, I hear that it is a very common issue. 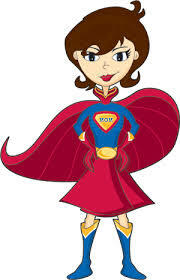 So, hang in there, SuperMoms! You can do it! As I’m writing this we have 30 minutes left before we have to leave our house. None of the kids are ready, I’m not ready, and Ian is in the bathroom. Hmmm. I’m going to try my best to stay calm and happy. « 4 Categories for Christmas gifts.